Liverpool remained unbeaten at home in the Champions League under Jürgen Klopp with a satisfactory performance in 2-0 win over Porto. Liverpool took advantage of Porto’s poor first half, which in the Champions League is more than enough to seal a game. In this tactical analysis, I will show you why Liverpool dominated Porto in the first half and how Porto grew back into the game. 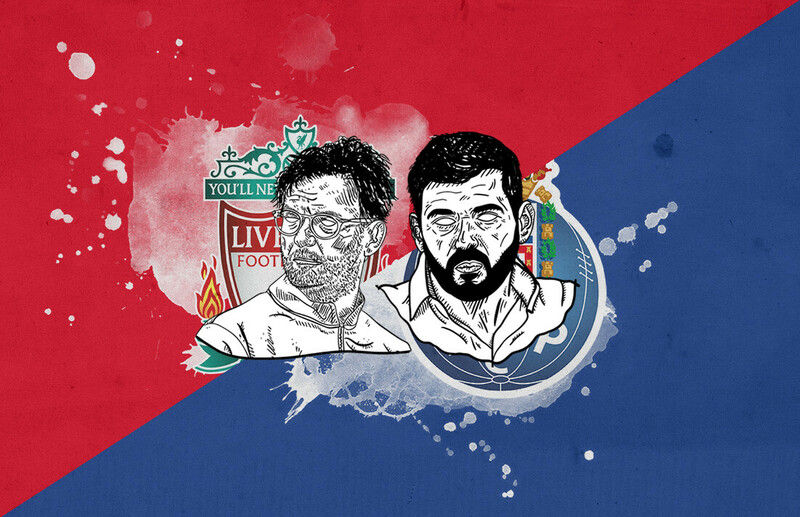 As expected Liverpool remained with their usual 4-3-3, with Matip rested and Lovren brought in, while Porto opted for a 5-4-1, with the aim of switching to a 3-4-3 in attacking transitions. Jordan Henderson picked up where he left off against Southampton, playing in a more advanced role in front of Fabinho, who also played an important role in the game. 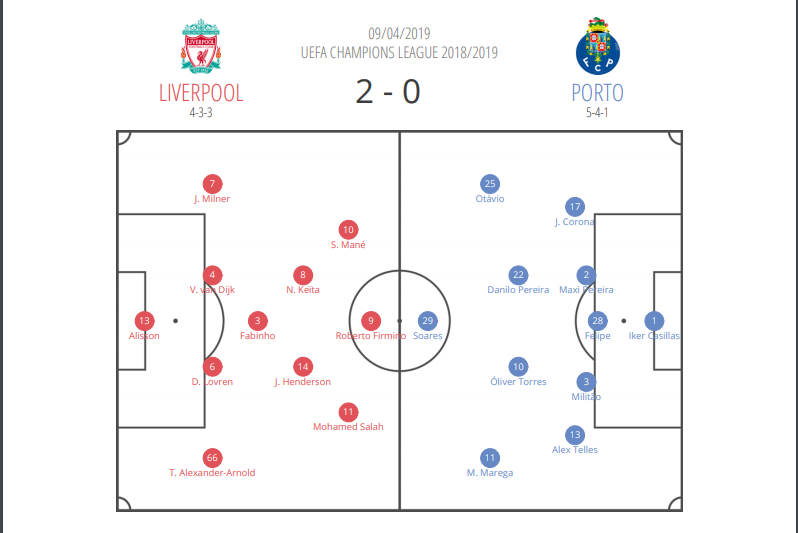 Porto remained compact both horizontally and vertically to limit the spaces between their lines and to prevent Liverpool from playing through them. However, when a team plays in such a compact shape with a high line, you would expect them to press aggressively with their compact shape as more people could contribute to the press. Porto in the first half instead played a high line and were vertically compact without any press, which made it too easy to play long passes over the top of their back line. Below we can see an example of Porto’s vertical compactness, with the distance between the first and last man very short. But as said, Porto didn’t press Liverpool high as we can see below. As a result, players like Virgil van Dijk, who excels at long passing, were given lots of time and space to pick out passes into the wide areas which were left unoccupied due to Porto’s narrow shape. Below we can see an example of Porto being too high and too narrow, which led to Alexander-Arnold causing them problems in the game. Sadio Mané also had a goal disallowed after peeling away from the full-back at the far post. The Portuguese side recognised their defensive problems and managed to remain vertically compact while playing deeper in their own half. We can see below that their backline is in a much better position to defend from. 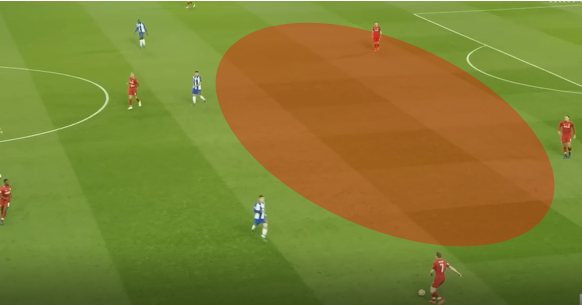 Liverpool cannot exploit the space in behind or through Porto, as they have so many players in such a small area. Liverpool’s threat from wide areas was also nullified as Porto became wider out of possession, with their wingers now dropping in to deal with the home side’s full-backs. Porto also started to cause Liverpool issues, with Marega having chances after getting in behind Lovren. This chance below came after Porto had beaten Liverpool’s press, which left Liverpool’s midfield three behind the ball. However, these situations happened rarely thanks to Fabinho having an excellent game. Fabinho showed the maturity and discipline that Liverpool expected upon buying him in the summer. He was expected to bring order to Liverpool’s at times chaotic midfield, and he certainly did this in this game, allowing Keïta and Henderson to excel further forward and press aggressively. We can see below that when Keïta and Henderson committed further forward in attacks, Fabinho would sit and cut out counter-attacks and transitions, playing a classic defensive midfielder role within the midfield diamond. Fabinho also helped to limit Porto’s build-up. When Liverpool pressed, with Keïta and Henderson stepping forward to press, Fabinho sat deeper and refused to be drawn out of position. This meant that when Porto struggled to build and managed to play the ball long, Fabinho was able to intercept the ball, as we can see below. Liverpool were consequently much less vulnerable when pressing high up the pitch and allowed for the two midfielders in front of Fabinho to take more risks out of possession. We can see in the image below that Henderson and Keïta have committed forward to press whereas Fabinho has remained rigid. 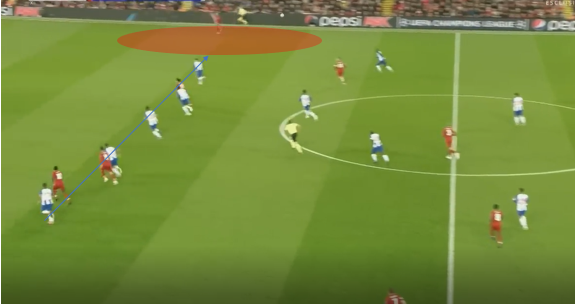 This fills the large gap between the players pressing and the defence, and prevents Porto’s striker from dropping deep and receiving the ball behind Liverpool’s pressing players. Liverpool capitalised on Porto’s tactical errors in the first half and managed to control the game in the second half. Had Porto begun the first half how they did in the second half, the game could have looked very different, with Liverpool struggling to break down deep blocks at times in the past. Porto now face an uphill task to attack without compromising this defensive solidity shown in the second half. Liverpool’s threat in transition is likely to see them through, particularly if they come up against another high line.